We would like to highlight the Outstanding Reviewers for Photochemical & Photobiological Sciences in 2018, as selected by the editorial team, for their significant contribution to the journal. The reviewers have been chosen based on the number, timeliness and quality of the reports completed over the last 12 months. We would also like to thank the Photochemical & Photobiological Sciences board and the photochemical and photobiological community for their continued support of the journal, as authors, reviewers and readers. 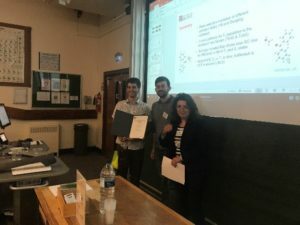 Congratulations to the prize winners at the JPA’s Annual Meeting on Photochemistry 2017! This month saw the occasion of the Japanese Photochemistry Association’s (JPA) Annual Meeting on Photochemistry 2017. 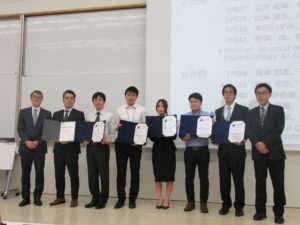 The meeting was held over three days at Tohoku University in Sendai and was a huge success, attracting 665 delegates and featuring 167 oral presentation and 314 poster presentations. 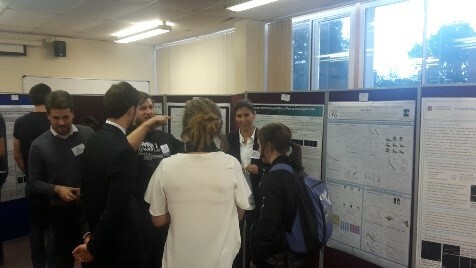 The Royal Society of Chemistry was on hand to offer prizes for student presentations. 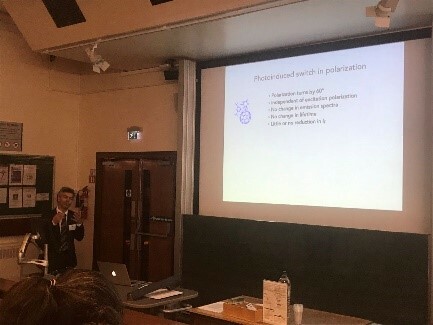 The winner of the Photochemical & Photobiological Science prize for outstanding oral presentation was awarded to Michihisa Ueda, of The University of Tokyo, for his presentation on Accelerated Ring Inversion of a [4n]annulene Derivative by Photo-stabilization of its Planar Transition State. 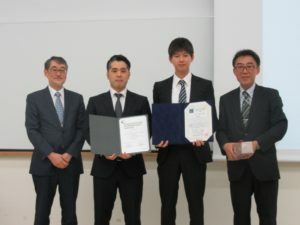 The winner of the Journal of Materials Chemistry A prize for outstanding poster presentation was awarded to Nobuhiko Nishitani, of Kyoto University, for his presentation on STM Observation of 2-D Self-Assembly of Photochromic Diarylethenes Having Oligopeptide Chains at the Liquid/ Graphite Interface and Its Photoresponsive Behavior. The Royal Society of Chemistry offers its hearty congratulations to all prize winners! The RSC Photochemistry Group meeting was held from 14th-15th September 2017 at the University of Birmingham’s Chemistry Department, attracting around 70 participants from across the UK and Ireland. 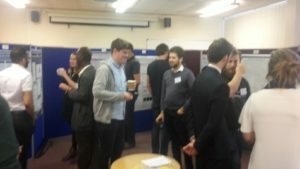 The meeting was designed to be a forum for early career researchers (ECRs) in photochemistry to present their work in a relaxed setting and to network with other Group members. 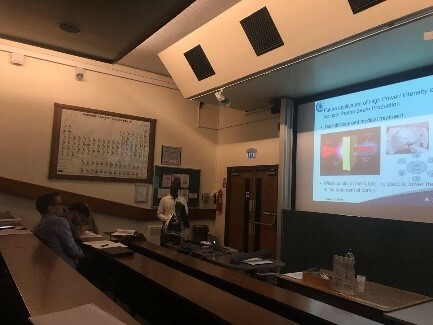 15 ECRs gave oral presentations covering the full range of modern photochemistry in its widest sense. The talks were of outstanding quality and led to excellent discussions. It is clear that the field is alive with many up-and-coming researchers. Supplementing the ECR talks were two Keynote Lectures by Helen Fielding (UCL) with her fascinating talk “Shedding new light on photochemistry in nature: biochromophores, protein chromophores and molecular motors” and by Photochemical and Photobiological Sciences Editor-in-Chief Dario Bassani (University of Bordeaux), who gave a stimulating lecture entitled “How to use supramolecular interactions to control excited states.” Two further tutorial lectures with a more pedagogical feel from Rob Neely (University of Birmingham) on “The chemistry of super-resolution microscopy” and Stan Botchway (Central Laser Facility) on “Excited-state lifetime imaging in bio-medical applications” completed the very diverse and interesting programme. The poster session with ca. 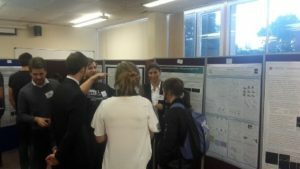 35 posters was well attended and generated lots of dialogue amongst the participants, which continued later on at the conference dinner held in Birmingham city centre. 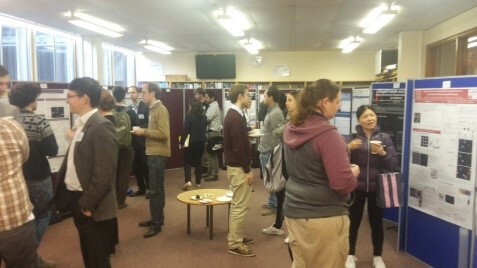 It was especially pleasing to see the engagement of the ECRs at these networking events, which hopefully has stimulated many new collaborations. Photochemical and Photobiological Sciences sponsored a prize for the best oral and best poster presentations. 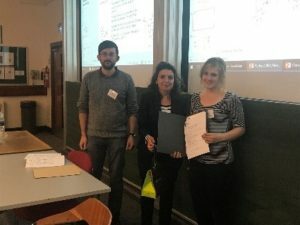 It was difficult to pick winners due to the extremely high standard of all of the presentations, but after much deliberation between the committee members, the oral prize was awarded to Dr Robert Godin of Imperial College London for his excellent talk entitled “Understanding Heterogeneous Photocatalysts By Time-Resolved Diffuse Reflectance Spectroscopy.” The poster prize was awarded to Fiona Black of Newcastle University for her very engaging poster “Probing Charge-Transfer Dynamics Using Time-Resolved Spectroscopy.” Congratulations Robert and Fiona! 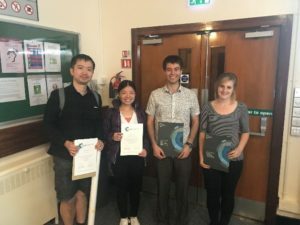 Two further poster prizes, sponsored by the RSC Photochemistry Group, were awarded to Yisu Wang from Cardiff University for a poster entitled “Novel plasmonic nanoparticles for applications in quantitative biosensing and bioimaging” and Huayun Shi from Warwick University for a poster on “Photoactive platinum anticancer complexes.” Congratulations Yisu and Huayun! 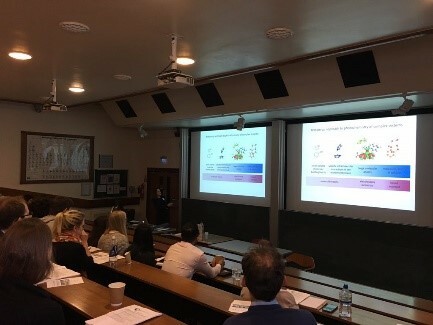 The organizing committee (Zoe Pikramenou, University of Birmingham, and Dr Robert Edkins, University of Oxford) hope that all attendees of the meeting had an enjoyable and stimulating experience and we thank you all for your participation during the meeting. We also thank PPS for sponsoring the prizes as well as the Faraday Division for a small meeting grant, University of Birmingham for hosting the event, and Photonic Solutions for sponsoring the poster session. We would like to take this opportunity to encourage you all to join the RSC Photochemistry Special Interest Group next time you renew your RSC membership and to follow us on Twitter @RSC_Photochem. Source: Brian Diffey Lab tests for measuring sunscreen effectiveness have some limitations. Scientists in the UK and Switzerland say consumers should rethink how they interpret the sun protection factor (SPF) printed on sunscreen bottles. Retailers have long used SPF to indicate how long sunscreen protected skin can endure sunlight without burning. Concerns that topical sunscreens do not provide the protection they claim are not new and arise from discrepancies between simulated and natural sunlight. Lab tests also assume consumers apply an even layer of sunscreen (2mg per cm2of exposed skin). In reality, this is in the region of 0.5–1.5mg cm–3, is far from uniform, and there are other factors, such as perspiration and rubbing, to consider. For photobiological investigations in relation to human beings, we hereby announce the awarding of the 18. Arnold Rikli Prize in the amount of 10.000,– Euro for the year 2017. The prize was originally awarded by the Institute F. Wolff of Riehen, Switzerland and first established in 1989. Jorg Wolff, the brother of the former sponsor, continues this tradition. The prize has been announced by the Jorg Wolff foundation every year since 2006 and stands under the patronage of the European Society for Photobiology (ESP). 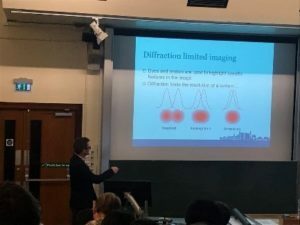 The submitted reports should cover investigations on biological effects of optical radiation (ultraviolet, visible, and infrared radiation). The results should show new aspects for diagnostic investigation and/or therapy or provide guidelines for the practical utilization of biologic basics and/or future research with optical radiation. Unpublished papers, or papers published after January 1, 2015 must be submitted in English language and be delivered to the office address or submitted electronically to the e-mail address mentioned below not later than February 28, 2018. The submission should focus on one area of speciality. An additional abstract of no more than 300 words should outline the research and the significance of it. In the case that the submission is “in cumulo” (five studies at most) a brief explanation should be provided uniting the presentations together. It is desirable to enclose a letter of support for the award nomination. An independent jury will evaluate the investigations and nominate the winner. The presentation of the award will take place at the Symposium “Licht und Gesundheit” in November 2018 in Berlin (Germany). We would like to highlight the Outstanding Reviewers for Photochemical & Photobiological Sciences in 2016, as selected by the editorial team, for their significant contribution to the journal. The reviewers have been chosen based on the number, timeliness and quality of the reports completed over the last 12 months. We would also like to thank the Photochemical & Photobiological Sciences board and the Inorganic community for their continued support of the journal, as authors, reviewers and readers. in the amount of 10.000,– Euro for the year 2016. The prize was originally awarded by the Institute F. Wolff of Riehen, Switzerland and first established in 1989. Jörg Wolff, the brother of the former sponsor, contin-ues this tradition and the price is announced by the Jörg Wolff foundation every year since 2006. The submitted reports should cover investigations on biological effects of optical ra-diation (ultraviolet, visible, and infrared radiation). The results should show new as-pects for diagnostic investigation and/or therapy or provide guidelines for the practi-cal utilization of biologic basics and/or future research with optical radiation. Unpublished papers, or papers published after January 1, 2014, must be submitted in English or German language and be delivered to the office address mentioned below not later than February 28, 2017 (two copies required). The submission should focus on one area of speciality. An additional abstract of no more than 300 words should outline the research and the significance of it. In case that the sub-mission is “in cumulo“ (five studies at most) a brief explanation should be provided uniting the presentations together. It is desirable to enclose a letter of support for the award nomination. An independent jury will evaluate the investigations and nominate the winner. The presentation of the award will take place at the Symposium “Biologic Effects of Light”, June 21 to 23, 2017 in Homburg/Saar (Germany).